Jazz workshop day 4, the week continues… Today featured local Vancouver saxophonist David Branter in two performances and a masterclass with our saxophone students. Dave performed with the faculty band at lunch and gave us a small taste of what was to come this evening. Dave chose a mix of compositions including standards and original compositions by both himself and Jared Burrows. Dave gave a saxophone masterclass this afternoon. His class was about jazz improvisation and use of Bebop scales. He took our students through a series of quick exercises that explored the use of myxolydian scales and a few patterns to help unlock the doors to modern bebop playing and help us aquire the technical facility to play such complicated patterns. Dave teaches at Vancouver Community College and has a website of saxophone essentials that has some online lessons, complete with mp3 and video clips. I would encourage our musicians to check it out. Tonight’s evening concert was a gas, easily one of the best performances of the fesitval so far with Dave and the band receiving a rousing standing ovataion at the end. Bravo!! 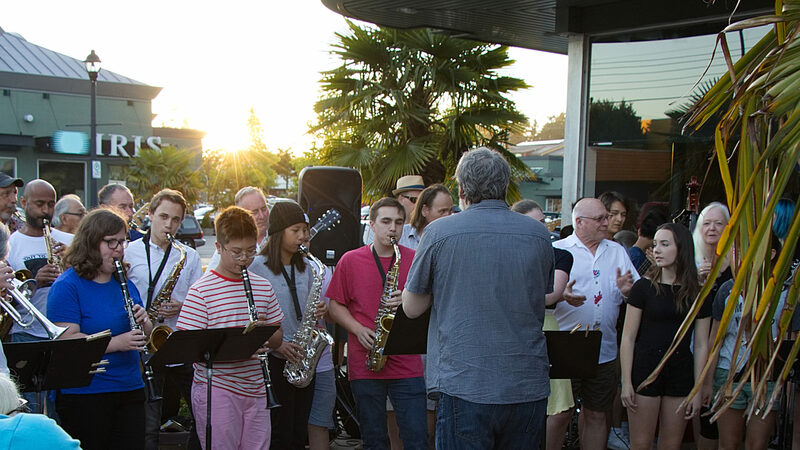 Tomorrow is the final day, with the student ensembles performing at Delta Hospital from 1 – 3pm, and the special evening concert with Steve Maddock and Lorne Kellett at the Tsawwassen Arts Centre. Tickets are going fast, only $10 – available at South Coast Casuals and at the door.